We recently discovered The Good Chemist. This beauty brand focuses on using only targeted, effective, clinically proven ingredients. This post takes a look at The Good Chemist’s answer to adult acne. Adult acne is a big problem. I thought by the time I got fine lines that I’d long be over acne. Instead, I have wrinkles and acne. We call it Wracne. And wracne is complicated. As a teen, I took the “scorched earth” approach to blemishes. I slathering my face with drying topicals to soak up the excess oil and dry the blemish to smithereens. And I scrubbed with acne washes. But this is too harsh on adult skin and makes wrinkles look so much more pronounced. What is even worse, is some of the moisturizers we use for wrinkles actually exasperate acne. Adult acne also tends to be cystic acne, and cystic acne pimples are little jerks. Cystic acne forms deep in the skin. Red, large, and painful, cystic acne is hard to conceal and can last for weeks. They are difficult not to poke and prod, and deceptively deep. Cystic acne can leave dark mark that lasts for months, even if you didn’t squeeze, pick or irritate it. 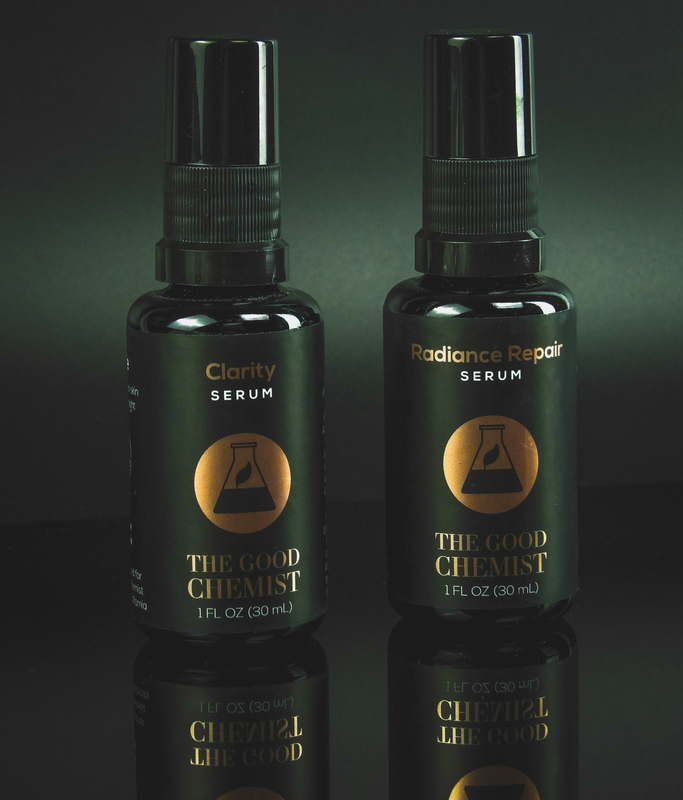 The Good Chemist is an adult approach to acne. It uses only ingredients that treat both wrinkles and acne. 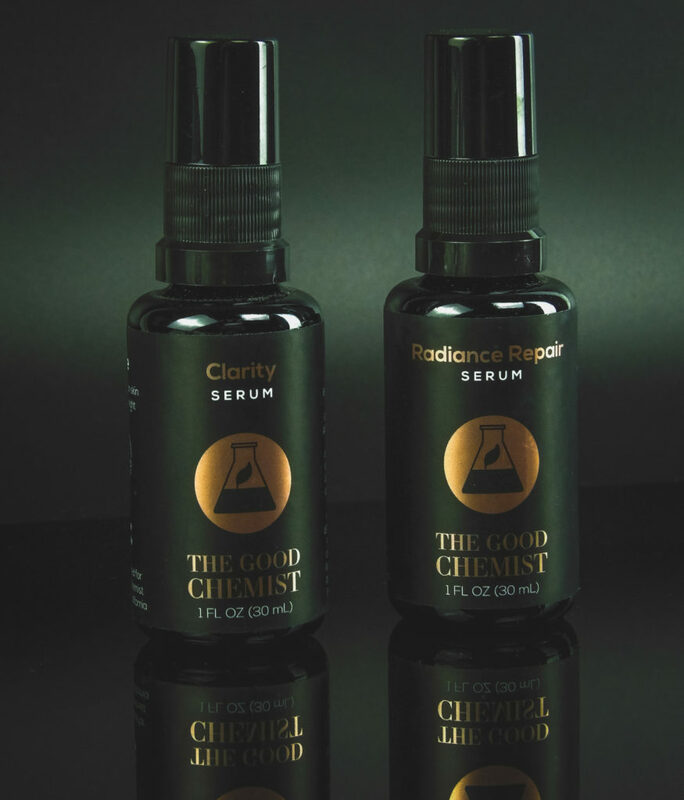 The Good Chemist was founded by a skin care obsessed female chemist. The brand uses only independently tested, clinically proven ingredients in all their formulations. The Good Chemist keeps skin care simple. Using many products can cause product interaction that irritates the skin. The Good Chemist uses only a few well-designed products that perform exceptionally. While you do good for your skin, you also help girls dreaming of becoming scientists. Every The Good Chemist bottle you purchase contributes $1 to STEM education programs. This duo is for treating adult acne without sacrificing proper anti-aging skin care. 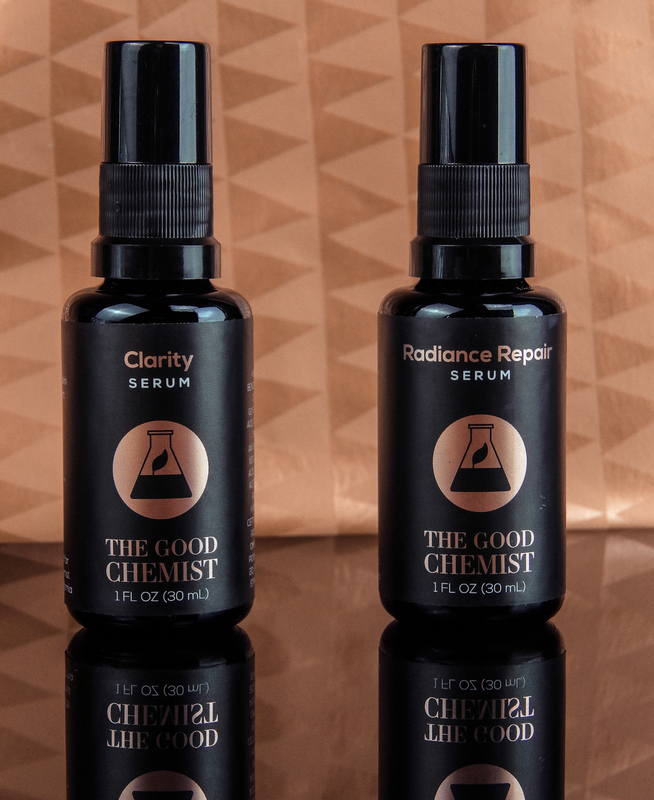 The Good Chemist Clarifying Duo addresses the hard to tackle adult acne with Clarity. Clarity combines two acids that purge debris and oil from pores. Salicylic works deep in the pore and glycolic acid clear the surface. Together, they eradicate pimple-causing “ingredients”. This eliminates the ability for a pimple to form, even deep cystic acne. Kaolin mattifies, dries out excess oil and existing blemishes without drying facial skin. Cucumber, seaweed, and aloe soothe skin so acne doesn’t appear dry and flaky, which makes it easier to conceal. Meanwhile, Vitamin C and peptides reduce post-breakout inflammation. I find that Clarity is surprisingly tolerable even with daily use. Glycolic also works as an effective anti-aging peel ingredient. Salicylic acid also promotes collagen production. So if you have to get adult acne, this ingredient combo makes the most out of it. Radiance Repair is the second product in this duo. It is a Vitamin C serum for adult acne with signs of aging. Does Vitamin C Serum leave your skin irritated and itchy? You aren’t alone. Radiance Repair Serum has two forms of Vitamin C, both are non-L-Ascorbic based. L-Ascorbic Vitamin C is the effective, cheaper yet irritating kind. Radiance Repair contains the other kind of Vitamin C, a stable, non-irritating variant. Radiance Repair reduces acne inflammation and fades acne scars. Vitamin E makes old acne scars softer and more pliable. A very grown-up sounding peptide Oligopeptide 68 balances melanin production. This supports the ability to fade discoloration. Radiance Repair also contains soothing Aloe Vera. The Good Chemist Let’s Be Clear Regimen was submitted to StyleChicks for consideration purposes. All opinions and experiences are 100% our own. It’s so hard to find a regime that isn’t irritating – thanks for the heads-up! It’s so hard to find a decent Vitamin C serum – they either are ineffective or too strong. Going to check out the line.